I’m one of those rare people who actually don’t mind house cleaning. Today I was washing the insides of my living room windows and told Alexa to play songs from Mario Lanza. As I listened to that amazing voice crooning old songs long forgotten, it brought back a flood of memories. As a young teen, I did a lot of housework. I wasn’t out running around with my friends, I was cleaning, cooking, ironing and playing “Mom”…. My mother was a single parent, a high-school teacher. When she got home each day she was exhausted and keeping house was never her forte. However, she did insist her three daughters keep things tidy, organized and dusted. In order to make the chores more palatable we would crank up the old record player and put on 33 1/3 rpm recordings of Mario Lanza, Jeanette McDonald, 1000 Strings, Verde, Mozart, Tchaikovsky and a variety of Opera and Arias. Yes, this was the years of The Beatles, Leslie Gore, The Mamas and the Papas and 1960’s rock and roll but Mom didn’t approve of our listening to those heathens. I had to do it on the sly, in the privacy of my bedroom with the volume turned down low. But I grew to love the classical music that Mom insisted we listen to. I can still picture myself with a dust rag in hand gently applying Old English to the maple table top while singing along with Mario at the top of my lungs. My mother was a formidable character, a narcissist, a strict disciplinarian. I didn’t realize how narrow and restricted my world was until I became a young bride at barely 19. I experienced decades of counseling and introspection dealing with Mom’s anger at my having left her and my need for her approval. Mom died three years ago. And in the midst of all the frustration, alienation and anger I endured trying to have a good relationship with her, I remember mostly the good things. The things that really shaped and impacted my life in positive ways. She went to college when I was beginning 4th grade and I learned along with her. When Mom took music classes I learned to love Mozart’s Requiem Mass, Verde’s Four Seasons and Tchaikovsky’s Nutcracker Suite. The beauty of their music still touches my soul. When Mom took Geology I became an avid rockhound and had an extensive collection I displayed in exhibits. I became a member of a Lithic and Lapidary Society as a teenager. Mom loved classic Literature. So I read along with her, far above my grade level. I fell in love with Gone With The Wind in 5th grade and have read that 1000+ page book at least three times through. 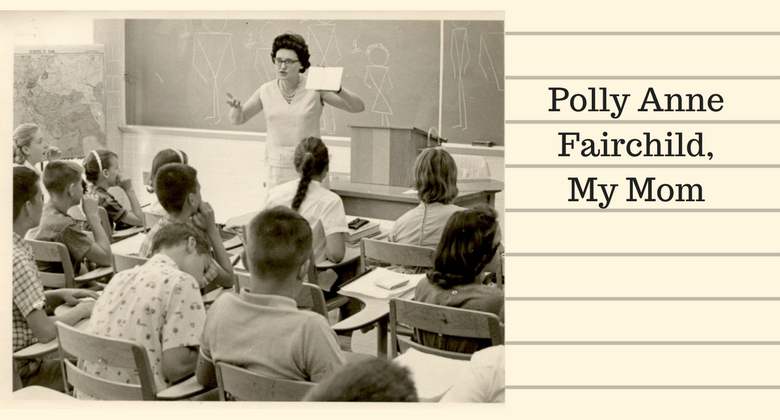 Mom studied English like it was her career…and it eventually became so….as a high school English teacher and head of the English department. I was not allowed to speak anything but perfect English and use the most proper grammar. That practice alone has led people to believe I have far more education than I really have! Because housekeeping was forced on me at a young age, I became really good at it. I continued to iron clothes long after it was no longer vogue. I can fix anything with a rubber band, thumbtacks and adhesive tape! I didn’t have a father around to do repairs so I became quite inventive. I could go on and on with examples of things I learned from my mother. We didn’t always have a good relationship. I didn’t always like or respect her. But I did learn from her. It wasn’t all bad. I have a sweet friend whose husband of over 50 years passed away a year ago. She told me recently that she had a good marriage even through the rough times. She said she was finding it harder and harder to remember anything but the good times. I think time does that. It’s kind of like birthing a baby. If we remembered the intensity of the pain, we probably would never have more than one! And like most things in life….We do have a choice. I choose to remember how Mom made me love Mario than to remember all the times she made me cry. Life is richer that way. You are so right on the money, Joanne; if we dwell on the negative, we will become negative and negatively esteemed, but if we dwell on the positive, the reverse is also true. This article is a great reminder for all of us. Thank you! Thanks for the comment, Bob! What you said is applicable to all areas of our life! Thanks, Bob….You are right. It is a choice and a state of mind! Wow Babe, I loved reading through this. I see so much of those early influences in you today – things I love and admire. Your Mother was a piece of work for sure but I also love that you learned to look for the good in people even back then. Thanks. I can remember many things I learned from her. She had her own issues for sure but she left me with a lot of good. And, for that, I am thankful. Wow! I remember this well. And fortunately for me, I didn’t realize as many negative behaviors from her as you did until I left home. You have done an extraordinary job of washing away and leaving a lot of the grief behind so that the positive experiences made you much of who you are! I think much of it was self preservation. Anyway, you deserve a lot of credit for the many years you have spent doing it. Because of your happiness, you have a strong and beautiful soul and a blessing to everyone that knows you! Aww, Thanks, Margie. Again, it is a choice we make in our lives….what direction will we go?? I recently talked to a lady who blames herself for many behaviors her grown children exhibit. I told her she had done the best she could at the time raising her children…the best she knew how. But her children are now grown adults and they can determine what good…or bad….they take with them through the rest of their lives. It is up to them. Thanks for the sweet comment. You are a dear heart. Ah, that was such an inspiring story to read and begin my day with! It was those valuable nuggets of wisdom, along with learning to work hard, AND all the great years you and Dan have shared together, that have shaped you into the really REALLY wonderful person you are today. Thanks, Archie….I think we would all do better by remembering the good in every circumstance rather than the ugly! We certainly have the choice to do so! Blessings to you!